TEAC was originally founded as Tokyo Television Acoustic Company in August 1953. Its goal was to be a leader in magnetic recording technology. Over the years, the challenge to be at the cutting edge of data recording technology has pushed the company forward. The guiding principle of TEAC is to enrich our society through our innovative products. For over 60 years, TEAC has been well known for video, image and sound recording technologies, and now introduces medical imaging recorders. With the continued growth of Minimally Invasive and Endoscopic Surgery and Hybrid OR, having very reliable and high quality solutions for the recording and playback of medical videos and images that are used to explain, educate, and share has never been more critical. With this focus on quality and reliability in mind, TEAC continues to develop convenient and easy to use recording solutions that meet and exceed the needs of our customers and partners. 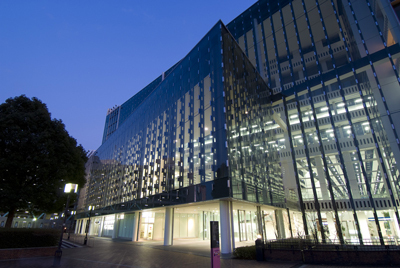 TEAC was originally founded as Tokyo Television Acoustic Company in August 1953. Its goal was to be a leader in magnetic recording technology. Over the years, the challenge to be at the cutting edge of data recording technology has pushed the company forward. The guiding principle of TEAC is to enrich our society through our innovative products. 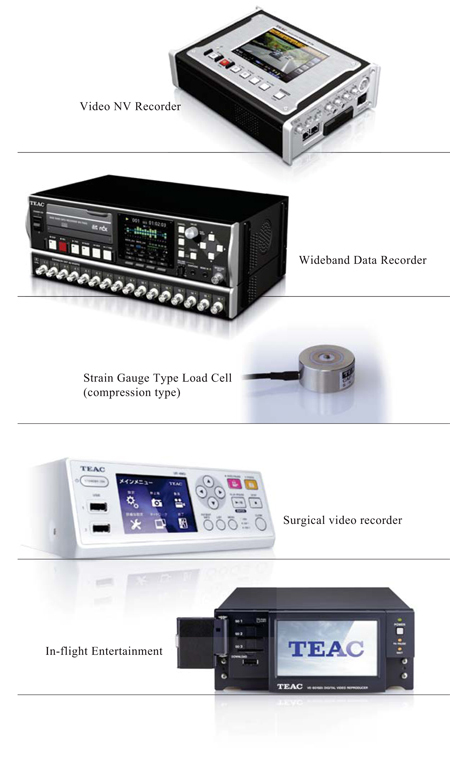 For over 60 years, TEAC has been well known for video, image and sound recording technologies, and now introduces medical imaging recorders. Human culture can trace its heritage back to three things: fire, tools and language. Spoken words were first recorded as handwritten words, followed by the introduction of the printing- press, allowing documents to be widely accessible to the general public. Human memory, on the other hand, deteriorates overtime, making it unreliable for precise intellectual activities. To compensate for this, accurate recording, storing and playback technology is indispensable for human progress. Therefore, advances in recording technology have been an integral element in the expansion of human thought and analysis. We all bear witness to the emergence of new ideas brought about by the ever increasing advancement of information and recording technologies. From paper to electrons, the format of information and data storage is constantly changing. As larger and larger databases are integrated into information systems, digital data storage will continue to play a key role in the establishment of new directions of creativity. To compensate for this, accurate recording, storing and playback technology is indispensable for human progress. Therefore, advances in recording technology have been an integral element in the expansion of human thought and analysis. We all bear witness to the emergence of new ideas brought about by the ever increasing advancement of information and recording technologies. Click here to learn more about TEAC corporation. By integrating recording technologies for all types of information, including sound, images, data, etc. with the remarkable advances being made in communication technologies, TEAC is steadfastly meeting the challenges of developing high quality technology, products and services that customers demand. TEAC is poised to make a major leap forward in the field of information technology. By developing and producing measurement and analysis devices, marketing and providing support, TEAC will contribute to R&D, basic technology development, and labor-saving at manufacturing sites in the industrial, disaster prevention, environmental, and basic medical sectors. After a measurement device measures and collects data, that data is recorded and integrated during the analysis and processing stages. The data thus compiled will yield valuable information for customers. TEAC is highly regarded around the world for its image and video recording technologies employed in special VTRs that can be used under harsh environments such as those encountered in space exploration. We also offer disc recorders for large-volume medical images for ultrasonic, microscopic, funduscopic examinations. Using basic technology for high-precision mechanics and image compression, we are developing new video and image recording devices for these image monitoring markets. TEAC has developed in-flight entertainment video players based on years of research into VTR technology. The device is designed for use under harsh conditions, so it features durable, compact and light weight design, as well as low power consumption. Perfectly fulfilling all of the requirements for passenger planes. TEAC started developing audio products from the very first days of its history. The first audio product produced was designed by TEAC founder Katsuma Tani and shipped in 1939. More than half a century later, substantial expertise in magnetic recording technology has culminated in the development of a range of outstanding audio products. That early knowledge helped to set the stage for Japan' s emergence as a major player in the electronics industry. The drive to enhance audio and video technology for years to come continues to motivate us to confront new challenges. Great audio comes from a passion for music. Music has the power to recreate the deepest emotions; TEAC' s high end brand, ESOTERIC has caused a sensation in the Japanese High-end audio world by continuously creating products that can capture the essence of the moment with the most state of the art technology. ESOTERIC is leading the world with its mastery of sound. Everyone can know the joy of listening to music. TEAC creates home audio products with the technology and creative thinking to allow you to incorporate music into your everyday life. Not just design, but functionality and usability have to be considered for a great product. From the newest digital media to the most reliable analog record player, anyone can experience a variety of media from past to modern day with these great products. Music is the product of a refined sensibility. In this domain, TEAC has consistently maintained the principle of faithfully reproducing the real essence of sound in recording and playback. During the postwar reconstruction period, TEAC was acclaimed for the design of its recording and playback systems used by Japan Broadcasting Corporation (NHK). 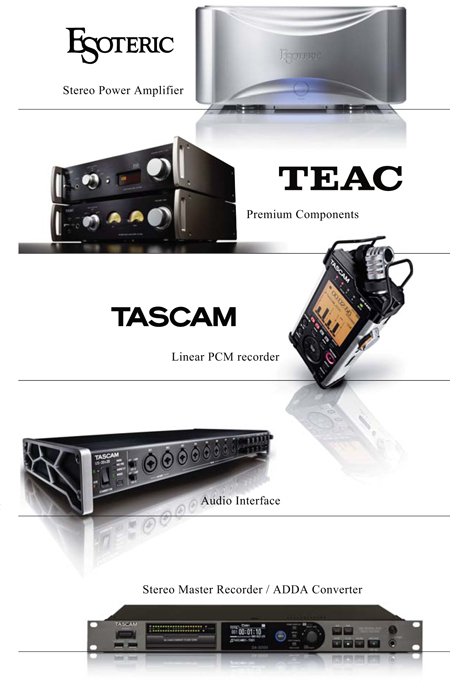 TASCAM products and recording and playback systems have reformed the world of creative sound.